Once upon a time there was a little girl whose only dream was to create music. She couldn't sing and she couldn't dance but she loved the beauty of sweeping sounds and dancing notes and longed to create their own. 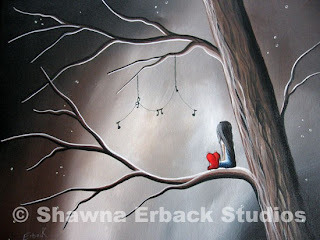 This painting by Shawna Erback Studios is one of those things that reminds me of my past and my childhood dreams. Once upon a time, that little girl was me. And on one wonderful and early Christmas morning, I unwrapped festive paper and opened a long, narrow box to find a sleek black case nestled inside. And inside that case was the most beautiful present I'd ever received. A flute. A flute that made my musical dreams a reality. Shawna Erback has a dreamy signature style to her artwork that touches the heart and makes me smile, and many of her pieces evoke touching memories in my own past. They might relate to yours too or be that perfect gift that you've been looking for to give to someone special in your life. 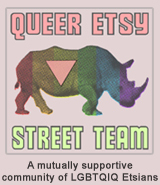 So stop by her shop an take a browse around. You won't be disappointed! TO VISIT SHAWNAERBACK'S SHOP YOU CAN CLICK THE PICTURE ABOVE OR, IF YOU'D RATHER, CLICK RIGHT HERE! lovely! This makes me wonder if you are still playing the flute. Memories. Thanks for this post and the gentle admonition to remember. A Fellow Jewelry Junkie... Gotta Love'em!